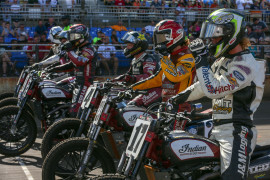 Bronson Bauman got his start in professional Flat Track racing in 2013, recording four top-5 finishes in his first year. In 2014 he was the runner up at the Peoria TT and finished third in the GNC2 class in 2015 with five podiums and a win at the Charlotte Half-Mile. He moved up to the GNC1 class in 2016, making three mains, and then went on to have four top-10 finishes in 2017 in the Twins class. Bauman started the 2018 American Flat Track season on the Bill Werner Kawasaki Ninja 650, and made a total of seven main events so far this season. Recently, Bauman has filled in aboard a factory Indian Scout FTR750 for Indian Motorcycle for injured riders Brad Baker and Bryan Smith. 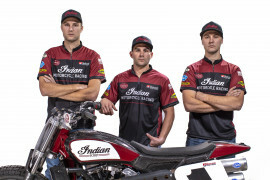 The switch to the Indian late in the 2018 season resulted in two top-10 finishes for Bauman, including a 5th place finish at the Buffalo Chip TT and a 6th place finish at the Black Hills Half-Mile. Bronson rides the No. 37 Factory Indian Motorcycle FTR750. 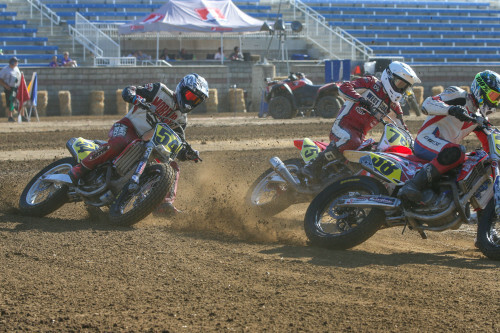 2017 Bronson Bauman finished the 2017 American Flat Track season 19th in the Twins standings. He raced in six main events throughout the season, had four top-10 finishes, and two top-5 finishes for the year, which came at the Daytona TT and Buffalo Chip TT. 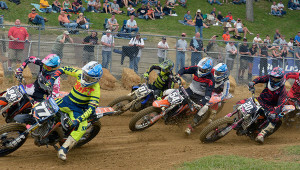 Made three GNC1 Mains, best finish of 15th at the Peoria TT. Raced for Rod Lake Honda and DPC Racing Kawasaki. 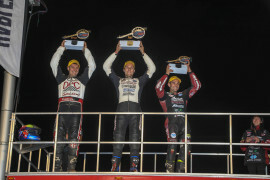 Finished third in GNC2 on the strength of five podiums, including a win at the Charlotte Half-Mile. Raced for Rod Lake/RGR/Hart Racing and Lombardi’s H-D.
2014 Qualified for every GNC2 main event on the season and finished in the top 10 nine times. 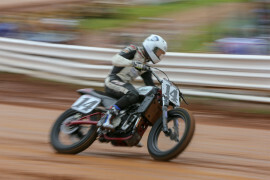 His best performance was a second place at the Peoria TT. 2013 Bauman reached seven main events and was runner-up at Castle Rock. He recorded three additional top-five finishes. 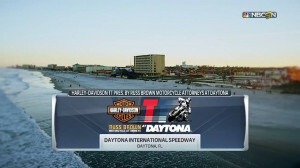 There is little doubt Henry Wiles circles two dates on the AMA Pro Flat Track Grand National Championship Schedule each season.